ADAPTIVE INNOVATION · Be methodical: Step 2 Ideate like it matters IDEATE IS A BETTER WORD for brainstorming. Why? First of all, there is no such thing as a storm in your brain. Ridiculous. Second, people don't take brainstorming seriously because they mistake it as being relatively straightforward (and partially ineffective). I used to think this too until I experienced the caliber of "storming" that takes place at Stanford's d.school. 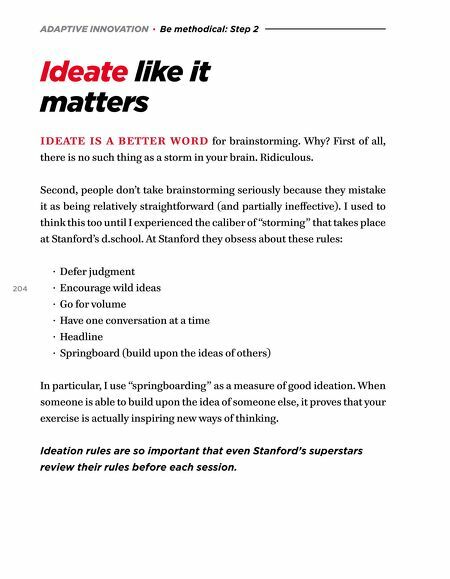 At Stanford they obsess about these rules: 204 · Defer judgment · Encourage wild ideas · Go for volume · Have one conversation at a time · Headline · Springboard (build upon the ideas of others) In particular, I use "springboarding" as a measure of good ideation. When someone is able to build upon the idea of someone else, it proves that your exercise is actually inspiring new ways of thinking. Ideation rules are so important that even Stanford's superstars review their rules before each session.